Have you ever noticed just how dang hard and expensive NOS parts can get? Finding old used parts is hard enough, but NOS parts is next to impossible ... at least affordable NOS parts. Sure, you can check out eBay, but have you seen the prices lately? I think GM made quality parts, but good grief, you would think some of these parts were made of gold! 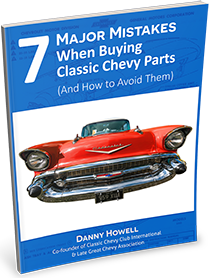 Well, you're in luck, here is the FASTEST and CHEAPEST way to get 1955-1970 NOS Chevy parts. In fact, whenever a customer is looking for NOS Chevy parts that we don't have in stock this has become the first place we go to find affordable NOS GM parts. It is a GOLD MINE! Watch the video to learn this easy restoration tip and make sure to leave us your comments below ... the audio in the video isn't the best, but my son was so excited that he grabbed the closest mic to record this thing and get it out to you as soon as possible. I think the content is so good that you won't even notice the audio. How do you find NOS Chevy parts? Do you have some other resources or tips for us? Share them in the comments below so that others may glean from your findings! Great tip! The Howell guys are first rate! I've used PartsVoice years ago when Chevy dealerships actually still had a lot of the hard to find parts in stock yet. The prices were fairly reasonable back in those days before ebay was around. The parts are now next to impossible to find on PartsVoice and if you do have someone responding back, there prices are sky high. I've had better luck on ebay with prices although some are high I must admit. A lot of these dealerships are long closed and are not on PartsVoice anymore or if a part does get a hit, when you call them or email the part in question is long gone and they didn't update their inventory.